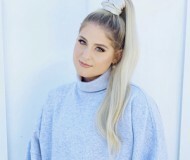 Following a minor stroke at age 18, she gained a Sony publishing contract and penned hits for the likes of Chris Brown, Dutch X Factor winner Lisa Lois, and Miley Cyrus (the American number two hit "Party in the USA"). After building up an established online presence, she signed to Universal Records and began working with the likes of hitmaker Dr. Luke (Katy Perry, Kelly Clarkson), Atlanta rapper B.o.B, and R&B producer Labrinth on her debut album, Who You Are. In 2010, her first single, "Do It Like a Dude," originally written for Rihanna, reached number 25 in the U.K. charts and, following in the footsteps of Adele, Florence the Machine, and Ellie Goulding, she was announced as the winner of the Critics Choice Award at the 2011 Brits. That same year, an appearance on Saturday Night Live coincided with her album being reissued in the U.S.
After finishing her second and final season of coaching on The Voice in 2013, J returned with the singles "Wild" and "It's My Party," which preceded her second album, Alive, that September. With a planned U.S.-only version of Alive featuring collaborations with Pharrell Williams eventually put aside, J instead focused on recording new material for what would become her third studio album, Sweet Talker. Including the likes of Diplo, the-Dream, and the aforementioned Pharrell, the album also saw her join forces with De La Soul and 2 Chainz, while Ariana Grande and Nicki Minaj both featured on the lead single, "Bang Bang," which debuted at number one in the U.K. and became a Top Ten hit in the U.S., Canada, Australia, New Zealand, and Bulgaria. Sweet Talker arrived in October 2014, reaching the Top Ten in the U.S. and U.K. Taking a break from music, she joined the cast of judges on television singing competition The Voice Australia. She returned in 2017 with the singles "Real Deal" and "Queen," which later appeared on her fourth LP, R.O.S.E. Read more on Last.fm. User-contributed text is available under the Creative Commons By-SA License; additional terms may apply.